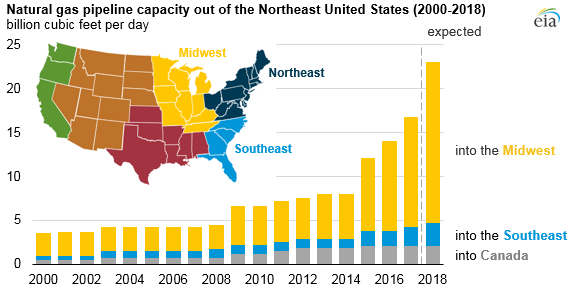 EIA expects construction of new natural gas pipeline capacity in the United States to continue in 2018, in particular in the northeastern United States. By the end of 2018, if all projects come online by their scheduled service dates, more than 23 billion cubic feet per day (Bcf/d) of takeaway capacity will be online out of the Northeast. This is up from an estimated 16.7 Bcf/d at the end of 2017 and more than three times the takeaway capacity at the end of 2014. 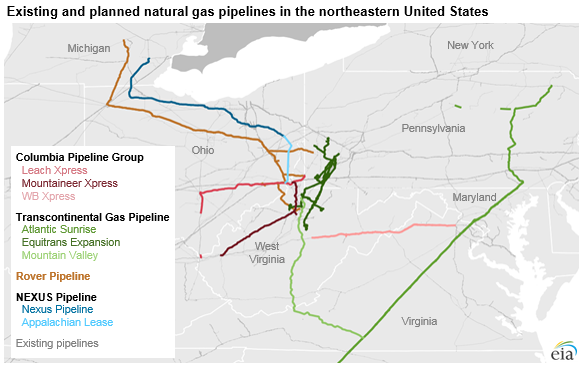 Currently, the growth of natural gas production in the Marcellus and Utica basins in Pennsylvania, Ohio, and West Virginia is constrained by the lack of available takeaway pipeline capacity to move it to new markets. As new pipeline projects come online, they will create an outlet for increased production, providing natural gas to demand markets in the Midwest, the Southeast, eastern Canada, and the Gulf Coast. Currently, no major pipeline capacity expansions in advanced development are slated to come online in New England because of stakeholder concerns raised in the development process. The Columbia Pipeline Group (TCO) has two expansion projects intended to add 4.2 Bcf/d of takeaway capacity out of the Northeast: Leach Xpress and Mountaineer Xpress. The Leach Xpress project, which entered service on January 1, 2018, supplies an additional 1.5 Bcf/d of capacity out of West Virginia and Ohio, and the Mountaineer Xpress project, which is scheduled to enter service in late 2018, will increase takeaway out of West Virginia by an additional 2.7 Bcf/d. As much as 2 Bcf/d of the natural gas from these two pipelines can be sent directly to the Gulf Coast via expansion projects on TCO’s Columbia Gulf pipeline, and the remainder will enter the TCO pool in Boyd County, Kentucky. Another TCO expansion project, the WB Xpress project, will increase mainline capacity to both the east (500 MMcf/d) and west (800 MMcf/d) when it is completed in late 2018. Three projects associated with the Transcontinental Gas Pipeline (Transco) are intended to add more than 3 Bcf/d of capacity out of Pennsylvania and West Virginia: Atlantic Sunrise, Mountain Valley Pipeline, and Equitrans Expansion. Atlantic Sunrise, the first phase of which was completed in 2017, is a nearly $3 billion project that will provide 1.7 Bcf/d of bidirectional capacity on the Transco System. The Mountain Valley Pipeline (2.0 Bcf/d), a new pipeline from West Virginia to the Transco system in southern Virginia, and the Equitrans Expansion Project (0.6 Bcf/d), which brings natural gas from northwest Pennsylvania to an interconnection with the Mountain Valley Pipeline, are also scheduled to come online in 2018. EIA is tracking more than 160 natural gas pipeline projects. Of these projects, 37 have been completed or are currently under construction and expected to come into service by the end of 2018. EIA’s Natural Gas Pipeline Projects tracker, updated quarterly, and EIA’s historical data for U.S. state-to-state pipeline capacities, are both available on EIA’s website. Natural gas now has a massive footprint in the United States. It contributes to almost 25% of the total energy consumption in the country, and remains the largest natural resource for producing electricity. Will opposition from the French hinder hinder Russia's natural gas pipepline that will bring energy to Germany and the continent? Appeals court in NY rules in favor of landowners fighting against a proposed pipeline from PA to Lake Ontario, as the court says eminent domain can only be used to gain access to private property if the project is legal (which the court says this..